A year is passed and June has come. On the third Saturday of June there will take place a great medieval festival, very famous in Italy: La Giostra del Saracino or the Saracen Joust of Arezzo. The Saracen Joust takes places twice per year (June and September) in Piazza Grande, beautiful square in Arezzo. This year it’s on June 19th at 9.30 pm. But the festival starts on Friday 11th when Captains take the inaugural oath and the draw of sequence of carriere (charges). Every day from Saturday to Tuesday there are the heats around 7.30 pm. 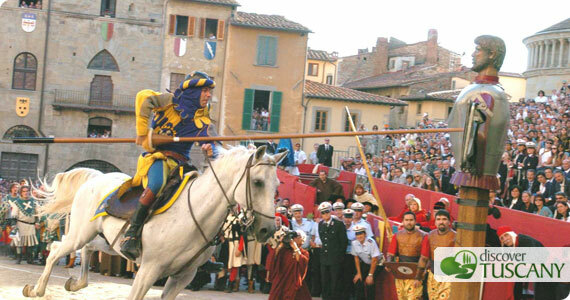 The Joust animates Arezzo for one week. In the tournament the 8 jousters or knights of the 4 Quarters of Arezzo (Porta del Foro, S. Andrea, Porta Santo Spirito and Porta Crucifera) fight each other to win the golden lance. Every jouster gallops his horse with wooden lance against the Buratto and its shield. The Burattto is an armor-plated dummy holding a shield that is divided into sectors corresponding to points. The jouster has two runs along the lizza (jousting track) that runs obliquely in Piazza Grande. The Joust is won by the Quarter whose jousters obtained more points. The price is a golden lance. The day of the Joust starts at 7.00 am with the first mortar shot and at 11.00 am the second one announces the parade of the colorful procession with over 300 costume characters. At 7.30 pm there is the blessing of the jousters and then the parade goes from the Duomo to Piazza Grande. At 9.30 pm, just before the start of the tournament, there is the flag-wavers performance. The Saracen Joust is certainly a beautiful medieval festival, whose origins date back to 16th century, that animates Arezzo every year with colors, sounds and flavors coming directly from the Middle Ages.